We arrived quite late into Bayeux after stopping at Caen about 20km away. There is a very good memorial to the war set in parkland which is well worth a visit. Outside is the image of a sailor grabbing a girl into a big kiss. Looks rather cute but reading about It shows that it is not a sign of Liberty but of possession. The women is being grabbed and made to submit by a stronger power just like countries in the war were made to submit. Quite powerful. We found our lovely small hotel B&B La Villa on a lovely green square. Poor Steve carried both bags up the stairs but it was worth it. Once again I’ve chosen well as its a charming room- big and airy overlooking a green square called ( appropriately) Place Charles de Gaulle. We are starting to hear a lot about Monseuir de Gaulle! We unpacked a few things then headed off to explore and what a lovely little city it is. Like all lovely French places it has its petit train to carry those not inclined to walk the cobbles. There are lots of green spaces and a little river running through the main part of the little city. Bayeux though very close to the beaches of the Normandy invasion, suffered very little bombing so the magnificent Cathedral and other buildings have survived. As I’m writing this I’m listening to the bells from the Cathedral tolling loudly over the city. Steve thinks it’s s call to beer! After dinner last night we waited for the wonderful “Lights of Liberty” or ‘Les Lumieres de la Liberte’ a light and sound show. 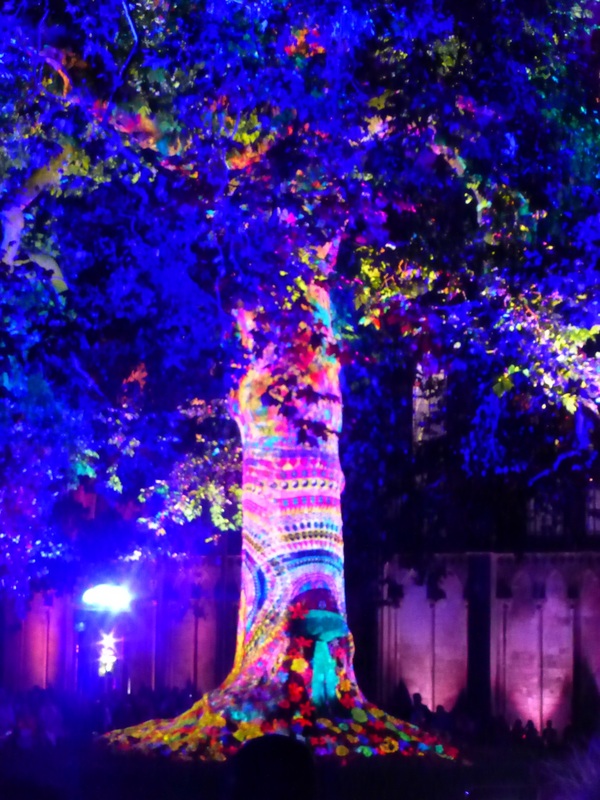 Colourful lights are projected onto a huge tree in the Cathedral square with accompanying music. It was magnificent if just a tad tiring for my ‘tourist’ legs standing in one spot for an hour! So we fell into our big comfy bed round 11.30 as the show can’t start till it’s dark and that’s around 10.20! Lucky our hotel is very close!